← Why Are Millions of Children in Mexico Still Suffering From Lead Poisoning? Who does toxic pollution affect the most? A global alliance has come together to issue the first comprehensive report of pollution’s impact on this invisible demographic — the poisoned poor. “The world’s poorest people routinely face the highest risk of exposure to hazardous chemicals due to their occupations, living conditions, lack of knowledge about safe handling practices, limited access to uncontaminated food and drinking water, and the fact that they often live in countries where regulatory, health, and education systems are weak…,” notes Veerle Vandeweerd, Director, Environment and Energy Group, UNDP. The Poisoned Poor: Toxic Chemicals Exposures in Low- and Middle-Income Countries was produced by the Global Alliance on Health and Pollution (GAHP), which includes the Asian Development Bank, the World Bank, the European Commission, UNDP, UNIDO and other agencies and governments. As many as 200 million people are affected. The amount of disease caused by toxic exposures is similar to that of malaria or outdoor air pollution. 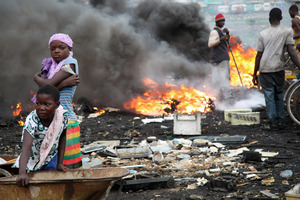 The majority of acutely toxic sites are caused by local business, many of them artisanal or small-scale. Surprisingly, international companies are rarely implicated. The impact of these diseases, and the commensurate loss in economic capacity, is enormous. Aside from the obvious health benefits, solving these problems usually promotes, rather than inhibits, economic growth. Interventions to mitigate these toxic exposures while protecting livelihoods have proven to be manageable. Download the one-page summary or full report here (in English, French, Spanish and Chinese). This entry was posted in Global Alliance on Health and Pollution (GAHP), Reports/Guides, Uncategorized and tagged GAHP, Poisoned Poor. Bookmark the permalink.